BAC's Strategy-Games is an innovative and fun way to teach children the logic and strategy behind a variety of games in a way that incorporates many STEM concepts while having fun learning games both new and old! 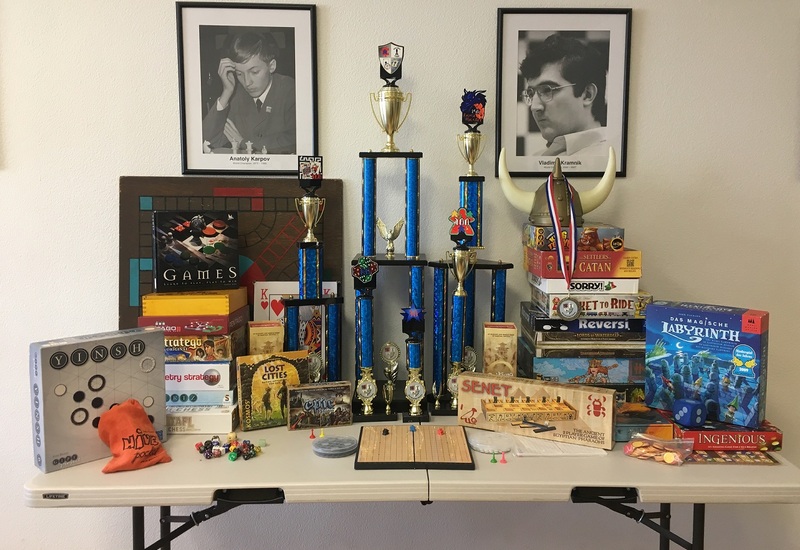 We use a variety of games (some with deep historical impact from cultures around the world and some home-brew games available only at BAC) to introduce the student to concepts in probability, game theory, pattern recognition, deductive reasoning, cooperation and creative thinking that leads to optimal decision-making in not only games of all types, but in life itself! We enjoy analyzing rules, dissecting the math behind certain game mechanics, solving (and creating) puzzles, discussing the history and impact of certain games or theories.. all while practicing sportsmanship, resource management, risk assessment, and cognitive 'advantage-based' reasoning. We also favor creative-thinking and design our own abstract or thematic board games, either from provided templates or purely from scratch! Coaches James Bethany and Jason Uerkvitz lead the ever-growing curriculum with a team of qualified and enthusiastic coaches and volunteers, bringing their vast experience in both teaching and Strategy Games to create a unique and fun filled experience in learning and gaming! No Strategy Games experience is ever the same, as the coaches incorporate and provide a variety of different concepts and the selection varies tremendously! We also have a special series of unique trophies designed specifically for the Strategy-Games branch of Enrichment, with it's own point system (stars), achievement badges and an emblem/logo designed by the regulars of the popular weekend clubs! CLUBS: Strategy Games is available every Saturday in 2 locations. We are in San Jose from 9am - noon as a combo club (Chess+Strategy-Games) and as a stand-alone club in Palo Alto from 1pm - 3pm. As with All BAC Clubs, we use drop-in scheduling and there is no registration necessary. The targeted age range is 6 to 14. Younger or older kids are certainly welcome, particularly in camps, but with a disclaimer that the material is best suited for kids within the suggested range. We also must emphasize that the physical materials in Strategy-Games can be fragile, therefore destructive acts or tendencies cannot be tolerated. If you are interested in our CHESS Camps, please click here to get general information about it. BayAreaChess has a weekly Strategy Games Club every Saturday 1-3PM in Palo Alto. Check out the page of the club to get more information. Full Day Camps from 9AM to 5PM. Early drop off (8:30-9AM) or Late pick up (5-5:30PM) is available. 3:50-5:00 Alternating Stations, Creation Period, Daily Challenges, Competitions, Analysis, Review. Cancellations made up to 7 days prior to camp start date will receive 75% refund. Cancellations request received with less than 7 days prior to the camp will receive a 50% credit of paid fees towards future camps, after-school programs or tournaments (only credits, no refunds). Cancellation request done on or after the first camp date is not entitled to any refund or credit. Camp schedule change requests made no less than 7 days prior to the camp start date will be accommodated, if availability permits. Those who wish to reduce from full day to half-day or reduce the number of weeks will need to refer to the cancellation policy listed above. Change request made less than 7 days prior to the first day of scheduled camp will incur a $25 administrative change fee. In case BAC needs to cancel the camps, we'll process a 100% refund to you immediately. We reserve the right to cancel camps 3 days prior to the starting date, so by Friday 8AM in case of 4 or less registered campers. In the past we had a few parents who picked up their child late at the end of the camp. Per our policy, we can not just leave the children at the camp sites by themselves. Coaches need to supervise them at all times. The late pick up has really caused an inconvenience to the teachers last year. This year a policy has been put in place that everyone who gets picked up 10 minutes after the camp is over (or, if paid for, the late pick-up time is over), will be charged $1 for each minute. We hope that this policy will not have to be enforced, so please, make your and our life easier by being on time.